I’ll fess up right away and admit I watched the royal wedding and enjoyed it. I did it as a gesture of respect for Prince Charles, whom I encountered fleetingly, last summer, as our vehicles sped in opposite directions along the loyalist parkway. We extended mutual waves and silently promised one another we’d meet again. Sir Elton John attended the Royal Wedding. 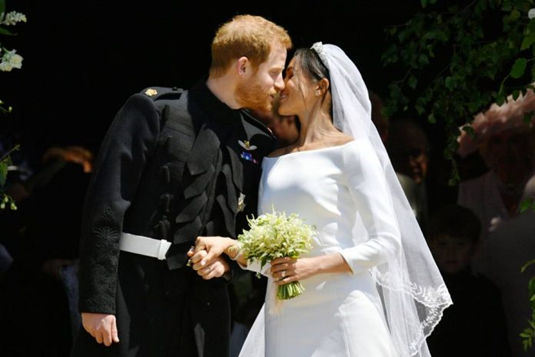 Yes, I teared up at the appropriate moments, such as the handholding, the veil lifting, the gospel choir, the sermon on love, the cellist, the first kiss on the church steps. The spectacle was a success, with typical British panache. Nobody threw an egg at the open carriage. Nobody objected when the traditional call for speaking now or forever holding your peace went out. None of the pageboys or flower girls went rogue. It was nice Ben Mulroney had a good seat; he must have arrived extra-ordinarily early or, perish the thought, shoved aside some elderly countess. Also good to see Sir Elton John found the time to show up, notwithstanding his heavy retirement commitments. I will leave it to others, more informed, to speculate about the significance of the marriage to the quest for world peace. They did seem happy together. Whether marriage will still go well when one of them thinks the other isn’t pulling his or her weight, with washing the dishes or doing the laundry, is a matter they will have to work out for themselves. The wedding was by all accounts a tremendous economic success. One British consulting firm put the boost to the economy at almost one and a half billion dollars, having doubled its estimate of just a few days earlier. I guess it’s true that no one ever went broke overestimating the capacity of the public for royal souvenir ware. All those biscuit tins, tea mugs, aprons and tea towels, not to mention official commemorative coins and china, add up to some serious money. A new royal style wedding for Canada. All of which got me thinking about royal weddings in Canada. We don’t really have any royals to supply the principals in the pageants. Still, Laurier Brisette, the 15-year old son of Governor General Julie Payette, could conceivably marry while she is deputizing as a royal. Nor do we have many celebrities in Canada. All right, we have Gordon Pinsent, Christopher Plummer, William Shatner and Donald Sutherland, but they can only get married so many times. We are missing what could be regular boosts to the economy; therein is an opportunity. Here’s what I propose. Let’s create an annual Royalty for a Day wedding opportunity in Wellington County. Every betrothed couple in Canada could apply. The prize would be the royal treatment at a wedding to be held in Wellington County, all paid for by our tourism promotion budget. It’s not that much of a stretch, especially if you believe the genealogists that say each one of us has a distant royal ancestor somewhere. It’s true we don’t have a castle to offer. The Reid’s Dairy building is outside the County. We do have some attractive barns, though. We have horse drawn carriages; well, more like wagons, really. We have choirs. We have florists. We have more than our share of amateur directors and experienced and expert directors that could stage a spectacular ceremony. We have actors that can step in and play father of the bride or some other essential role, on short notice. We have an ample supply of street-throngs, skilled at engaging with parade walkers. Our community radio station and three local papers; four, counting the Coffee Time News, assures healthy media coverage to draw in a heap of local, regional and even international attention. Royalty for a Day would be a win for the couple and a win for the County. The winners could get married over the annual Victoria Day holiday weekend. That would enable the couple to take a few days to honeymoon, in the County, in advance of peak tourist season, and catch the annual bluegrass music festival the following weekend at Salmon Point, before heading home. I’m looking forward to hearing The Dusty Drifters myself. Once the idea catches on, as it surely will, the County could sit back and watch the trinkets fly out the door. Who wouldn’t want to acquire a 2021 “Matt and Tiffany” set of Royal Daulton figurines? Even a 2030 “Ariel and Jupiter” hand crafted tissue box cover? I’ll repurpose my “County Boy’ baseball hat and call it a “fascinator,” just to be ready in case I get asked to attend.